I tossed and turned all night. 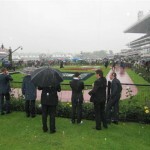 Derby Day – the greatest day’s racing on earth – and the forecast is for Armageddon. It’s dry, mild and warm when I get there early. Horses are even sweating up.You Know Who is walking around in the parade ring already, untroubled, and unnoticed by the teeming throng. The rain sets in quickly and by time of the Mackinnon you would describe it as soggy. The champ streets them. We’re all starting to think that he’s a freak and that he’ll have no problem with the distance and the wet on Tuesday. Two early bets before the rain for a winner and a loser. I’m just exercising my money. 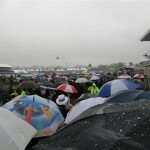 And I’m glad I didn’t drive to the track or I’d still be there. This is my fifth anorak day for the spring. Someone even offered to buy it off me after the last! I’d give it away if only the weather would improve. I’m sitting in a tram full of punters, the number 70, rattling along Flinders Street towards the Tennis Centre. It’s Derby Week and this is our Spring Ritual. We’re off to the Tabcorp AGM at the Melbourne Park Function Centre. We’re a bit gloomy. It’s not like the good old days when our shares were rattling along like You Know Who. We’re only worth half of what we were before the GFC. And now they’re going to split the company in two and throw away $150 million refurbishing Randwick. We need some answers! In the olden days when Ross (The Boss) Wilson was the CEO we loved coming to these meetings. We all fondly remember the year the Tabcorp logo collapsed dramatically on the stage, and the year when the projector jammed and Ross The Boss did his block, and the year when there was a power strike and a lack of heating. But Ross used to make us feel warm and fuzzy with profit increases and juicy dividends. The punters rarely had a question and if they did it mainly related to the quality of the refreshments on offer outside. No one complained a bit about the 100,000 shares that were to be added to Ross’s stockpile of 3.7 million. We were happy punters. This year there is only half the usual number of punters. They are mostly your retired or unemployed, geriatric type punter, much like myself. I suppose that’s why the numbers are down, with many now unable to afford the tram fare or falling off the perch. Our new CEO, Elmer Funke Kupper, is spitting the dummy after the demerger and taking a swag of cash with him. This time there is some discussion, and Stephen Mayne, the shareholder activist, is brilliant in taking the board to task over remuneration and long term incentive payments. He succeeds in making the chairman angry and even a few shareholders ask him to sit down. They must be the ones who are only here for the feed. After the stampede for food has settled down I manage to talk to one of the executives who explains the Randwick deal to me. 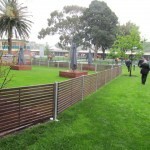 It seems that in return for the refurbishment Tabcorp will be allowed to put Trackside, their racing game, in NSW TABs. Apparently it is a real money spinner. It’s hard to believe that a video game with fake races can be the saviour of Tabcorp! I always thought that it was just a novelty. But there you go. And oh! The refreshments were most excellent. They even had lamb cutlets! The media have gone wild over You Know Who, with gushing descriptions of the horse: “Handsome – a classic-dished Arabian head, with a picture book white star”. And “deep through the girth and long in the rein”. And “a big loose sort of horse with the right superstructure and a lovely head”. A few words are even extracted from Bart himself: “He’s a big powerful horse. A great constitution. Good action, and he’s got a great will to win”. And “His coat’s got dapples on it. He’s very healthy. There’s plenty of him.” And heard on TVN: “he looks good in the skin”. I’ve never paid much attention to skin, or coat condition, although I know some horse watchers place great store by it. No doubt they are an indication of good health, but dapples are also a function of coat colour, and you only see them on bays and greys. I’ve yet to see a dappled chestnut. You Know Who’s dapples are mostly visible on his underside and barrel, whereas usually they are more prominent on the thigh, buttock and neck. Stanzout has outstanding dapples, but he still finished tailed off ten lengths last in the sprint, and they didn’t help Zantelagh much in the last race. The TV news showed Gai toasting More Joyous under heat lamps to keep her happy in her skin, but the tactics probably let her down, not the dapples. The track is rated Dead (4) but they are running Good (3) times so I’m allowed to bet. My best for the day was Hot Danish in a six horse field. She paid $1.90 for coming second by 5.5 lengths to Black Caviar, whereas the winner only paid $1.40 the win and $1.20 for the place. I boasted to all and sundry about how clever I was. In the babies race I backed Elite Falls who was totally relaxed in the yard and had the benefit of a previous run in Sydney. And I liked Absolutely in the second race and managed to secure $2.50 with the bookmakers for a solid second placing, compared with a miserly $1.90 on the tote. So three out of three. I only had my anorak on for half the day so my frustration with the weather is improving. 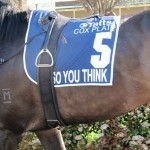 And no bet on the Cox Plate. 5.35 pm? I should be home and tucked up. It’s too late in the day for gambling. And the mares race at 6.20 pm? I’m with Bart on this. The sooner the VRC takes over the Valley the better. I’m in full winter gear. Long johns, jumper, anorak, gloves and beanie. This is not a day for horse watchers. Horses can look terrific in the yard, but it doesn’t help them if they can’t pick up their feet in the wet. A day for mudlarks. The track is Heavy 10, but is upgraded before the Cup to Heavy 9, except for a 200 metre section out the back, which is still Heavy 10. Why would the stewards bother? Maybe so that Monaco Consul can wear his pacifiers? I watch the horses in the parade ring with that fine judge of horse flesh, Les Carlyon. 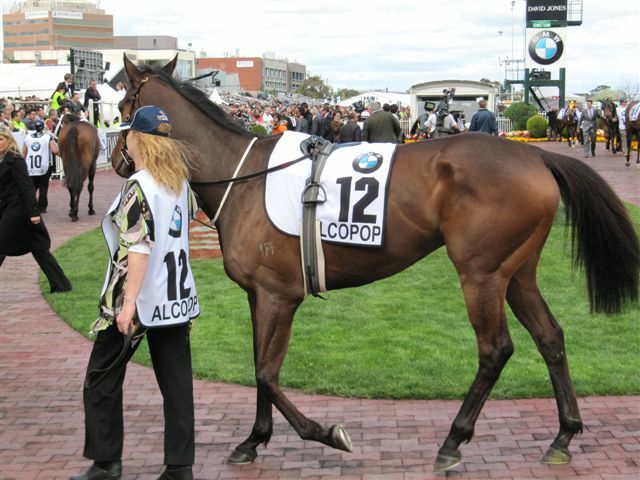 We both agree that the horse which is trained to the minute is Alcopop. And I like a couple of others. Shocking is very relaxed, but still hasn’t fined down (see blog archives: September 4), and Harris Tweed is jumping out of his skin. 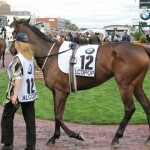 My final selections are Alcopop, Harris Tweed, Shocking and Herculian Prince. Faint Perfume is sweating up and Monaco Consul has too much gear – a crossover noseband and pacifiers. I’m hoping to lay Faint Perfume, but it’s way over my $2 limit place threshold. So I back Alcopop for a place. It drops out last and runs on around the corner before floundering in the ground. 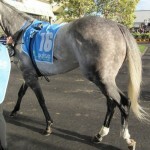 Descarado is a good winner for Gai. The horse had no faults. Remind me to remind myself: never bet in the wet. I don’t know why I’m going, really, as the forecast is for rain and more rain. The track is rated a Dead 5 but downgraded to Slow 6 for the first and then Slow 7 for the third, and then finally a Heavy 8 for the last. The jockeys rated it a Heavy immediately after riding in the first. Stewards are much slower to respond. But I had a nice phone call from Alasdair Robertson, the Melbourne Racing Club CEO, promising to put things right for today, so I’m keen to check it out. And sure enough a workman is removing the blockade on my first pass along the stalls. More power to the punter! 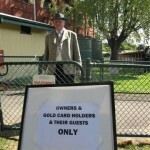 Maybe the club will now consider putting the name cards back on the horse stalls at Betfair Park, or even, God forbid, putting race numbers on the cards. 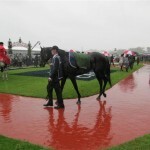 It didn’t stop raining on my racebook all day. Too wet to bet. Still no word from John Brumby about the replacement buses. I love this day. The true start of spring. But it starts off badly. John Brumby should hang his head in shame. They are working on the Broady line so there is a replacement bus to North Melbourne. If you have had any experience with replacement buses you know to fear the worst. So with trepidation I proceed to the designated bus stop and wait 25 minutes for a bus to arrive. 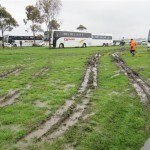 But it is the Craigieburn bus, going the other way. I eventually give up and decide to walk ten minutes to Macaulay Station. Another bus turns up so I run back to the designated bus stop to catch it. The driver says it’s a Craigieburn bus and that I need to wait on the other side of the road, where I’ve just come from, to get the North Melbourne bus. Back I go. Then again I give up waiting and head off for Macaulay. Half way there the North Melbourne replacement bus passes me. Then another. And then another. A trifecta of buses. And of course I miss the train at Macaulay. So after much planning to be there nice and early I miss the first race. And what a disaster awaits. 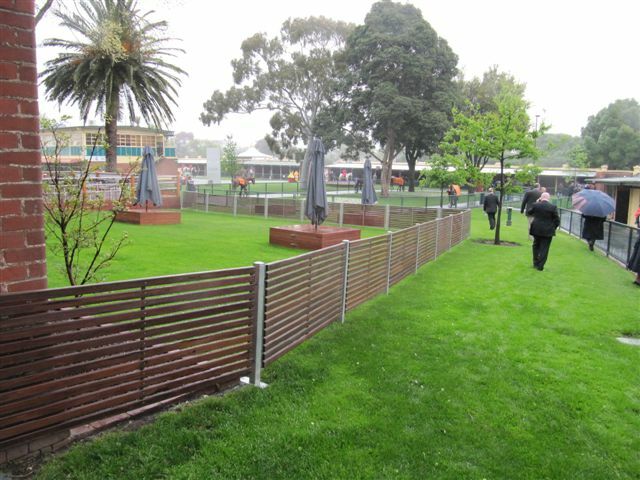 The Melbourne Racing Club has blocked off access to horse stalls 75 to 95 to allow Aquanita Racing a patch of green grass for a private function. The horse watchers are infuriated. I seldom get angry, but I stomp over to the raceday office to voice my complaint. What a disgrace! The reason I pay my membership is to look at the horses, and here, on one of the most important days of the racing year, I am unable to see all of them. The CEO, Alasdair Robertson, should hang his head in shame. I run around for a few races like a headless chook, urging people to complain. I even use some bad, bad words. My language has certainly gone downhill since I’ve been watching Deadwood on ABC2. I finally settle and promise myself to send off a fax when I get home. I saw a few nice horses. I started out well by backing Amaethon in the second race which should have won at $2.90 the place. 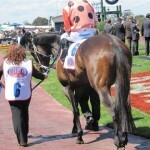 And I narrowed the WFA sprint down to the champ Black Caviar and the Sydney horse Winter King. I couldn’t believe the place odds about Winter King. I took $3.80 on the tote but I then noticed that Waterhouse had it at $4.20. I should have doubled up. So coming into the guineas I was cashed up and made my second mistake for the day. The first of course was the replacement bus. 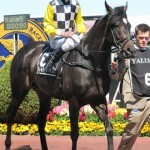 Ilovethiscity looked stunning in the yard, a picture of health and fitness, but compounded quickly in the straight. Boss thought the horse was lame, but the stewards found nothing amiss. In the last race I liked another Sydney horse, Dorf Command, but after you have had a loser you start umming and aahing a bit, and I was still umming with my wallet out and walking towards the tote when they jumped. Dorf Command flashed home for a miracle third at $3.30, but without me aboard. So my perfect strike rate has been diminished, but my eye is now officially on fire. 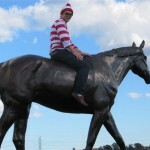 On the train home I wonder whether Brumby ever rides the replacement bus, or whether Robertson ever goes out back to look at the horses? My equilibrium has been quite unbalanced. It throws you right out of whack, racing on a Sunday. I was already unsettled by the Collingwood premiership, and was fearing for the worst. Would Flemington be overrun by hordes of tattooed, toothless bogans? My fears turned out to be quite unfounded. I only saw two people in Collingwood jumpers down at the parade ring, and both had all their teeth, although one was in fact tattooed. I have also learnt that a sleeve is not something on the end of a shirt, but a technicolour tatt that covers the whole arm of a Collingwood supporter. I was already unbalanced because I had lost $100 before I even arrived on course. On Saturday The Missus dispatched me to Vic Market with two fifties for my wallet to do the fruit and veggie shopping. When I opened my wallet to pay for the oranges the $100 had vanished into thin air. It makes you question yourself. Did I put them in the wallet in the first place? Maybe I was done over? Snitched? Maybe my brain has broken? It’s a funny, peculiar thing – I can lose $100 at the races and it doesn’t even register, but at the market? I think it’s the not knowing that nags you. The mystery. How the hell? Much better to lose it on a horse. So, again, a pretty quiet day. The Turnbull was too hard. I was left with Shocking, Zipping, Zavite, Metal Bender, Zabrasive, Faint Perfume, Jessicabeel, Dariana and Descarado all looking good. My top fancy was Faint Perfume. 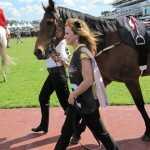 Zipping was terrific and I was half tempted since I backed him in the Australian Cup. But in the end no bet. 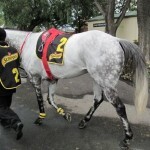 Only one bet for the day on the Sydney horse Strawberry Field which got up for third at $4.30. So my 100% strike rate is still intact for the new season. I just need to get settled, find my balance, and have a few more bets.